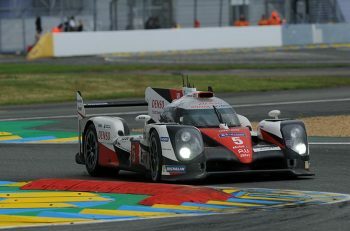 While there was excitement aplenty in the other classes, particularly with potential podium changes in all three classes, LMP1 had started to look fairly settled as the race entered its final two hours, barring any major dramas. Certainly the pitstops for the two leading Porsches appeared fairly routine, and the crews expressed little sign of concern, even appearing relaxed as they worked quickly and efficiently through their chores. The scene when the Audis made their pitstops seemed slightly less assured, with the activity appearing just a tad more frenetic, but everything continued to go without incident, and at half-past the hour, Hulkenberg had a full lap over the #17 Porsche in second, and two laps separated Brendon Hartley from Tréluyer in third. Out at the Porsche Curves, Mardenborough was taking the #23 Nissan GT-R off down the escape road at Corvette, the start to the Porsche Curves, with the front of the car engulfed in steam or smoke. It seemed unlikely that the car would make it back to the pits. Elsewhere, the ByKolles CLM was slowing after a spin across the kerbs, and making a laboured return to the pitlane. Ten to two and there was a brief flurry of pitstops, with Albuquerque bringing in the seventh-placed #9 Audi, and stops for Buemi in the #1 Toyota and Imperatori in the #13 Rebellion. The #4 ByKolles had returned, perhaps a little prematurely, to the track, and was running slowly once more. Five before the hour and Dumas brought the #18 Porsche in for tyres and driver change to Neel Jani, the pole-setter. Into the penultimate hour and Oliver Turvey was pushing harder than ever aboard the Jota Gibson, closing down relentlessly on Sam Bird who, despite some quick lappery, was finding it increasingly hard to fend off the challenge. At 13:20 the gap stood at just six seconds. The net effect was that Bird, pushing equally hard in the G-Drive Ligier, was starting to close on Lapierre in the #47. Just 56 seconds – perhaps the narrowest the gap had been in hours – stood between first and second. 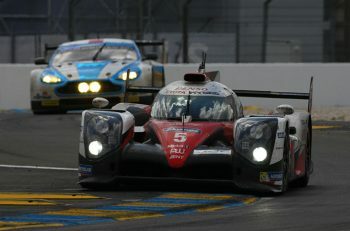 A little further back there was potential concern for the #34 Oak Ligier, seen to be visibly slower that it ought to be. At 13:25 Vanthoor took the black and purple coupé down the pitlane, and backwards into the garage. The margin over Berthon in the Murphy Oreca had been a generous five laps, but as the car stood static for longer and longer, the possibility of the #48 stepping up to fifth started to look more likely. The change came on the run down the first stretch of the Mulsanne, and as the two approached the braking zone for the first chicane. Turvey pulled out of the slipstream and took the inside line into then right-hander … and emerged triumphant on then other side. With Bird behind him, Turvey had clean air, and started to ease clear. A half second advantage stretched to nearly a minute by the end of the lap, thanks, in the main of course, to G-Drive’s decision to being Bird in for a pitstop. Goaded into a response, Lapierre set new fastest sectors for the #47. 13:40 and it was Turvey’s Turn to make a routine pitstop, with the Jota crew displaying athletic prowess in their efforts to get the car refuelled and back out again as quickly as possible. Turvey had no sooner departed the pitlane than the #47 was in, with Lapierre staying aboard as the car was refuelled for what is probably the penultimate time. Turvey meanwhile had benefited most from his crew’s hard work, and had managed to emerge on track with his second place safe, and a 29 second buffer in the bag. … and sure enough, at 13:50 Berthon powered out of the Ford Chicane and thundered up pit straight to take fifth from the Oak, still rooted in the garage. Just before the end of the hour and there was a coming together between Tracy Krohn in the #40 Ligier and the Pegasus Racing Morgan on the run through Ford. The two cars touched, and the green Ligier took the brunt of the contact, spinning off across the front of the Morgan. The #29 seemed to survive largely unscathed and pressed on, but the Krohn Ligier sustained a left-rear puncture. Tracy Krohn then had to complete a full lap with a deflated rear tyre. It was slow, and awkward. News came through almost on the hour to confirm that the #23 was a retirement, with Mardenborough’s Nissan GT-R suffering a gearbox failure and no means of returning to the pits. That left just one Nissan still racing, albeit last of the classified runners. Notable changes being the problems for the #34, still listed in sixth, but stationery. David Rigon was left therefore with the job of saving something of the GTE Pro race for AF Corse Team, now running second in the #71. Half way through the hour though, Gianmaria Bruni re-emerged from the #51’s pit after a stop of over 30 minutes and just in time to mount a defence for third position. There was no official word on its trouble, but a lot of attention had focused on the steering wheel and possible gear selection issues. Oliver Gavin was (say it quietly…) starting to look like he had his race under control, though no doubt the team would be beside themselves with apprehension. As the final hour drew near, the British driver held a five lap advantage over Davide Rigon in the #71 AF Corse car, who wasn’t putting his Ferrari under any undue pressure. 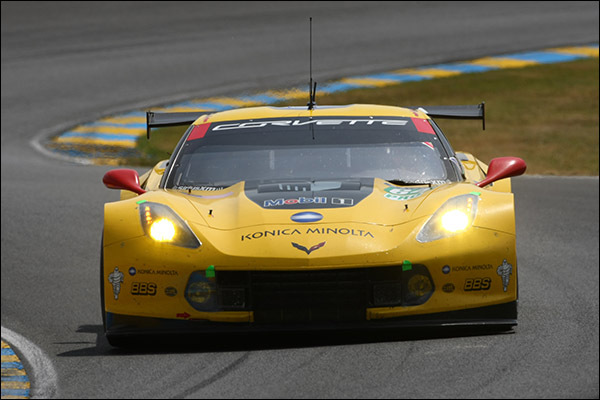 Gavin’s times had understandably eased too, now eight seconds off the #64 Corvette’s best. With the exception of Mike Parisy’s #68 AAI Porsche 911, who was having fun trying to retain his 1 minute 20s advantage over the #66 JMW Ferrari by setting the car’s best lap times of the race, GTE Am had eased off the pace. Marco Seefried was now aboard the Dempsey-Proton Porsche, its third place looking reasonably sound, as the leading #98 Aston Martin for the first time allowed itself a bit of a breather. Between these, Bertolini’s Ferrari would need some luck one way or another to affect his second place.